NASHVILLE – October 04, 2018 — iHeartCountry announced today that they have joined forces with TC Restaurant Group - who operate several restaurant venues in the Nashville area including; Jason Aldean’s Rooftop Kitchen + Bar, Luke Bryan’s 32 Bridge, FGL House, and more – to launch a satellite studio. The newly designed satellite studio is located at 305 Broadway- next to Jason Aldean’s Kitchen + Rooftop Bar. “This is an unprecedented opportunity to bring iHeartCountry to Broadway and into Nashville’s newest venue, where Country music is made and played,” said Gator Harrison, iHeartCountry Brand Coordinator. The new studio will be home to the CMA nominated Tige and Daniel show weekday afternoons from 3 p.m. to 7 p.m. Its location will allow the station to usher in a number of artists as well as serve as a special event studio for Cody Alan with CMT, The Bobby Bones Show and iHeartCountry station broadcasts from around the country. “TC Restaurant Group is committed to Nashville and particularly South Broadway and we are excited to continue to show this commitment with this Partnership” says Adam Hesler, President, TC Restaurant Group. Nashville’s Historic Broadway is well-known for being an entertainment district and home to Nashville's live country music and most visited honky-tonks. In addition, Nashville’s Historic Broadway has easily become one of the most visited destinations in Nashville for both fans and artists alike. iHeartMedia Nashville owns and operates WSIX-FM, WNRQ-FM, WRVR-FM, WUBT-FM, WLAC-AM, WRNQ-HD2 and is part of iHeartMedia. With over a quarter of a billion monthly listeners in the U.S. and over 131 million social followers, iHeartMedia has the largest national reach of any radio or television outlet in America. As the leading audio and media company in the U.S., iHeartMedia serves over 150 local markets through 849 owned radio stations, and the company’s radio stations and content can be heard on AM/FM, on satellite, at iHeartRadio.com, on the company’s station websites and on iHeartRadio, iHeartMedia’s digital music, podcast, on demand and live streaming radio service, available on over 250 platforms and 2,000 devices, including on digital auto dashes, tablets, wearables and smartphones, on virtual assistants, smart speakers, TVs and gaming consoles. iHeartRadio offers users the country’s top live radio stations, personalized custom artist stations created by just one song or seed artist, on demand features and the top podcasts and personalities. The all-in-one digital service has more than 1.7 billion downloads, 120 million registered users and is the No. 1 commercial radio podcaster in the U.S.
NASHVILLE, TN - Sept. 17, 2018 - As an avid supporter towards the fight against breast cancer, current three-time CMA nominee Jason Aldean will celebrate his annual "Concert For The Cure” at Jason Aldean's Kitchen + Rooftop Bar in Nashville on Oct. 3rd. With all proceeds benefitting Susan G. Komen Central Tennessee, the night continues Aldean's longstanding partnership with Susan G. Komen after raising more than $3.6 million to benefit local Komen Affiliates across the country. Fans will be treated to an intimate performance by the three-time ACM Entertainer of the Year after a three-course meal off the restaurant’s menu, with all food being donated courtesy of TC Restaurant Group. Beginning today, a limited number of tickets are now available for $100 at https://bit.ly/2D44LVY (exact seating is based on group size and time of guests’ arrival). "I've witnessed first-hand how much this horrible disease impacts women and their families,” said Aldean. "My fans know how important it is to me to be part of this fight and they’re a big reason we’re able to contribute so much to Komen each year." In 2004 the multi-PLATINUM artist launched his efforts to support Komen’s fight against breast cancer, after losing a close friend to the disease. Since his first "Concert for the Cure,” Aldean has donated a portion of proceeds from all ticket sales throughout the years in efforts to fund research to find breakthroughs for the most deadly breast cancers and ensuring that all people receive the care they need. Aldean is only the second Country act in history to score four consecutive chart-toppers on the all-genre Billboard 200 albums chart with his current GOLD certified album REARVIEW TOWN, which follows his six previous LPs that achieved PLATINUM certification or better. Following his 21st career No. One and multi-week chart topper "Drowns the Whiskey" featuring Miranda Lambert, Aldean releases his follow-up single to Country radio with "Girl Like You" serving as the third release from his record-breaking eighth studio album. He continues the momentum behind the multi-week chart topper and RIAA's only PLATINUM Country song released in 2018, "You Make It Easy,” as he blends together sensual rhythms with powerful vocals. The path paved by his wide-open sure-footed approach has defined the genre’s 21st century including more than 17 million total album sales and countless recognition from the GRAMMYs, ACMs, CMAs, BBMAs, People’s Choice Awards and more. He is a perennial live-show favorite for the format as he has headlined the biggest stadiums in the United States and continues to host sold-out crowds on his HIGH NOON NEON TOUR. For more information and for a full list of upcoming tour dates, visit www.jasonaldean.com. 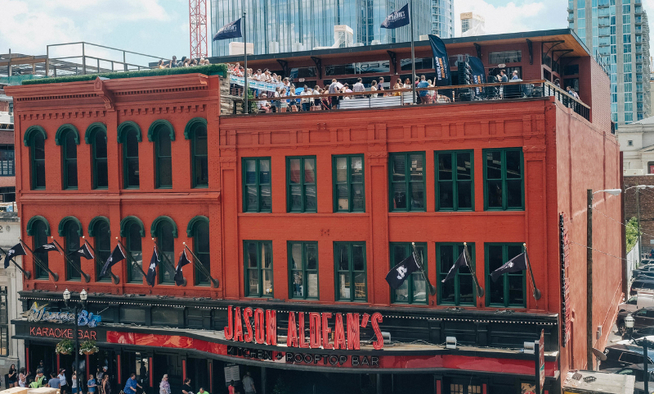 Jason Aldean's Kitchen + Rooftop Bar opened in the summer in Partnership with TC Restaurant Group and welcomes guests inside four levels of good times, Southern food with a flare and live entertainment designed to make each visitor a part of Aldean’s Army. TC Restaurant Group, with locations across the country, operates restaurant venues in the Nashville area including; Luke’s32 Bridge Food + Drink, FGL House, Sun Diner, Luigi's City Pizza, Crazy Town, Tequila Cowboy and Wanna B's Karaoke Bar. For more information on Jason Aldean's Kitchen + Rooftop Bar visit http://jasonaldeansnashville.com. There's a party at Luke's place -- and you're invited. Luke Bryan will play a free street concert -- Luke's 32 Bridge Party on Broadway -- in front of his new Lower Broadway restaurant and bar Luke's 32 Bridge Food + Drink on Monday, Sept. 10. The event starts at 6:30 p.m.
"I’ve been looking forward to this for some time," shared Luke. "Couldn’t think of a better way to kick this place off than to have a big party right on the streets of Broadway." The concert, which will include Bryan's full setlist, is part of the grand opening festivities for his Luke's 32 Bridge Food + Drink that has been open less than one month. The facility is located at 301 Broadway in Nashville. Parking for the concert will be at Nissan Stadium. SUPPORT LOCAL JOURNALISM: The best coverage of Music City. On sale now. Bryan, who is nominated for the Country Music Association's Entertainer of the Year, has spent the summer headlining stadiums around North American on his What Makes You Country Tour XL Stadium Sized. By the end of October, Bryan will have headlined 13 sports complexes including events in Toronto, New York City, Pittsburgh and Boston. The last time Bryan played a free event downtown Nashville was before game six of the Stanley Cup Playoffs in June 2017, and attracted 60,000 people. Bryan, who recently celebrated his 20th No. 1 hit "Most People are Good," is poised to pick up his 21st chart-topper. The singer's "Sunrise, Sunburn, Sunset" is at No. 2 on the country radio airplay charts. In 2019, Bryan will return to the judges' table on ABC's 'American Idol' alongside Katy Perry and Lionel Richie. 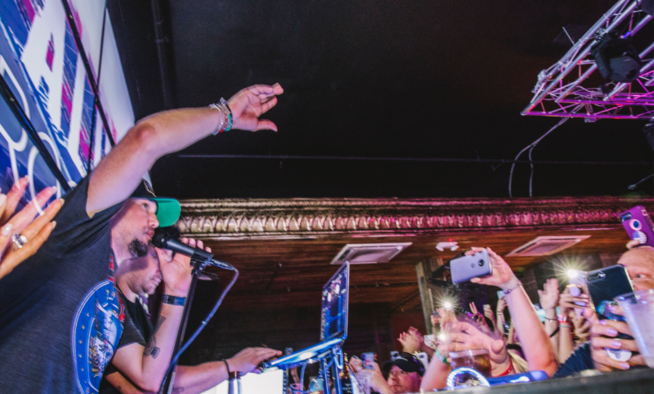 Nashville – July 10, 2018 – Country music superstar Luke Bryan is set to open Nashville’s only six-floor entertainment facility in the heart of Music City, LUKE’S 32 BRIDGE FOOD + DRINK. The must-see hot spot is located in Nashville’s most sought after zip code with a prime location in the downtown district on the corner of 301 Broadway at 3rd Avenue. The 30,000 square foot building features six levels of entertainment space with eight bars, including Broadway’s only multi-level rooftop bars with sushi menu, four stages of live music and two restaurants. The name, LUKE’S 32 BRIDGE FOOD + DRINK, was inspired by Luke’s childhood home near Route 32 Bridge in Lee County, Georgia and is housed in Nashville’s iconic American National Bank Building. The facility, in partnership with TC Restaurant Group, is scheduled to open this month. Visitors to LUKE’S 32 BRIDGE FOOD + DRINK will enjoy an aw-inspiring view from the multi-level rooftop that features Nashville’s only rooftop Sushi Bar with Chef Nick Phrommala. Chef Tomasz Wosiak helms the LUKE’S 32 BRIDGE FOOD + DRINK signature restaurant where he has created a menu inspired by some of Luke's favorites with special twists on Southern and American cuisine. Take your pick from hearty favorites Hometown Pulled Pork with Kettle BBQ chips, Black & Blue Salmon Salad, Nashville Hot Chicken to Luke's Elk Burger with Red Dragon Cheese. Burger fans are set-to-go with the Farmers Burger, featuring locally-sourced, all natural beef with over easy egg, maple bacon, cheddar cheese, lettuce, tomato, onion and signature sauce. Other go-to dishes are Beet Mixed Green Salad with Citrus Vinaigrette & hand-tossed oven-baked margarita and pepperoni pizza work to fill out a world-class menu. LUKE’S 32 BRIDGE FOOD + DRINK will offer one-of-a-kind drinks including some of Luke’s personal choices like “Backstage”- vodka, grapefruit, with or without salt; “Play It Again”- cherries, vanilla bourbon, lemon juice, sugar and “Luke’s Old Fashioned”- muddled cherries & oranges, cubed sugar & bitters, ice, whiskey & water- plus more. Go to www.lukes32bridge.com to learn more about LUKE’S 32 BRIDGE FOOD + DRINK. Luke is a two-time Academy of Country Music and Country Music Association Entertainer of the Year, a five-time host of the ACM Awards, a NSAI Artist/Songwriter of the Year and he was named a CMT Artist of the Year six consecutive years. Luke has more certified digital singles than any other country artist with 40 million tracks and 12 million albums with three Billion music streams and he was the most-streamed country artist from 2012 to 2016. Luke has placed 20 singles at #1, 11 of which he co-wrote, and has headlined arena tours and sold-out stadiums across the U.S. performing for 1.5 Million fans in 2017 alone. This year, Luke’s “What Makes You Country Tour,” named Billboard Music Awards Top Country Tour, will run through the end of October with 40+ concerts and boasting 13 stadiums shows. And recently announced, Luke, along with Katy Perry and Lionel Richie, will return to the judges table for a second season on ABC’s American Idol. TC Restaurant Group owns and operates venues across the country including Crazy Town, FGL House, Jason Aldean’s Kitchen + Rooftop Bar, Luigi’s City Pizza, Sun Diner, Tequila Cowboy and Wanna B’s Karaoke in Nashville. Visit http://tcrestaurantgrp.com for more information. 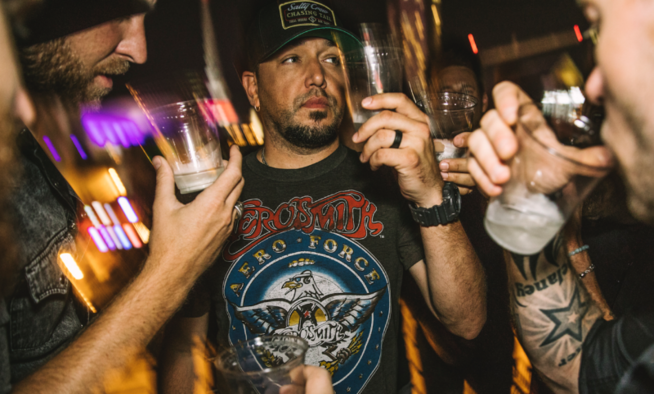 JASON ALDEAN'S KITCHEN + ROOFTOP BAR features nearly 30,000 square feet of space including 250 dining seats, six bars and a world-class kitchen with Southern food. World-renowned Chef Tomasz Wosiak teamed up with Aldean to create a menu that is a mix of his Southern-cooking favorites, steaks, pastas, salads and more - including a unique, food-in-a-basket concept and a dessert menu. The superstar worked alongside Chef Tomasz to recreate his mother's own Homemade Peach Cobbler, ensuring the family recipe was done to perfection. Inside guests will find a 1961 4020 John Deere tractor serving as a tribute to Aldean's multi-PLATINUM No. One hit "Big Green Tractor." Two giant video walls will showcase guests' favorite sporting events - as well as all the hottest videos from today's country stars - while the mezzanine level will include an official store packed with memorabilia, T-shirts, hats, jackets and a signature glassware line. With private, VIP experiences available for groups up to 1500, JASON ALDEAN'S KITCHEN + ROOFTOP BAR is the perfect location for all types of events. For more information about JASON ALDEAN'S KITCHEN + ROOFTOP BAR, visit www.jasonaldeansnashville.com. "Aldean has opted to not back down and continue working in the well-worn groove" (UPROXX) that has helped define the genre’s 21st century with his sure-footedness, which plays into more than 15 million total album sales, dozens of sold-out stadium shows and countless recognition from the GRAMMYs, ACMs, CMAs, BBMAs, People’s Choice Awards and more. Continuing that momentum, Aldean is only the second Country act in history to score four consecutive chart-toppers on the all-genre Billboard 200 albums chart with REARVIEW TOWN, with six of his previous LPs have achieved PLATINUM certification or better. Aldean's wide-open approach has made him a perennial live-show favorite for the format as he has headlined the biggest stadiums in the United States. He continues to do so on his HIGH NOON NEON TOUR and "doesn't waste any time ripping through 23 songs during his 95-minute set,” (Des Moines Register). For more information and for a full list of upcoming tour dates, www.jasonaldean.com. TC Restaurant Group, with locations across the country, operates restaurant venues in the Nashville area including; FGL House, Sun Diner, Luigi's City Pizza, Crazy Town, Tequila Cowboy and Wanna B's Karaoke Bar. NASHVILLE, TN - May 09, 2018 - On the heels of his 20th career chart-topping single, three-time and reigning ACM “Entertainer of the Year” Jason Aldean announces JASON ALDEAN’s KITCHEN + ROOF TOP BAR. In partnership with TC Restaurant Group, the four-story entertainment complex in the middle of downtown Music City''s Lower Broadway (between 3rd and 4th Ave) will open in June featuring live music on every floor, a one-of-kind homestyle menu and rooftop bar with customized cocktails. JASON ALDEAN'S KITCHEN + ROOFTOP BAR will feature over 27,000 square feet of space in the neon-lined heart of Music City, 250 dining seats, six bars and a world-class kitchen, welcoming guests for good times, Southern food and live entertainment - all designed to make each visitor a part of The Aldean Army. “It’s pretty cool to finally have my own spot downtown where people can go and have a good time,” said Aldean. “We’ve been working on this for a while and I’m looking forward to having everyone in town for CMA Music Fest help break it in." Live music will spill over two floors each and every day - focusing specifically on new local talent and as well as artists from across the country - and the venue will also be home to the largest outdoor patio on Broadway. 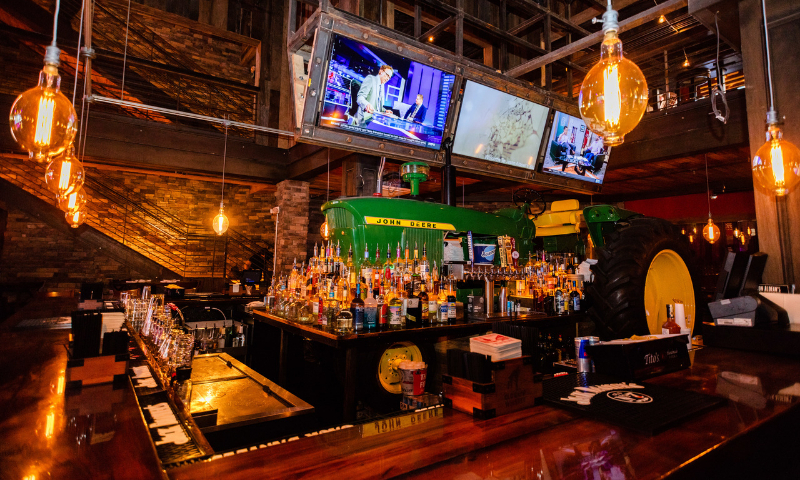 The rooftop bar will serve freshly made cocktails with a panoramic view of the Nashville cityscape, while guests inside will find a 1961 4020 John Deere tractor serving as a tribute to Aldean's No. one smash hit, "Big Green Tractor." World-renowned Chef Tomasz Wosiak teamed up with Aldean to create a menu that is a mix of his Southern-cooking favorites, steaks, pastas, salads and more - including a unique, food-in-a-basket concept and a dessert menu. The superstar worked alongside Chef Tomasz to recreate his mother's own Homemade Peach Cobbler, ensuring the family recipe was done to perfection. Two giant video walls will showcase guests' favorite sporting events - as well as all the hottest videos from today's country stars - while the mezzanine level will include an official store packed with memorabilia, T-shirts, hats, jackets and a signature glassware line. With private, VIP experiences available for groups up to 1500, JASON ALDEAN'S KITCHEN + ROOFTOP BAR is the perfect location for all types of events. For more information about JASON ALDEAN'S KITCHEN + ROOFTOP BAR, visit www.jasonaldeansnashville.com. "Aldean has opted to not back down and continue working in the well-worn groove" (UPROXX) that has helped define the genre’s 21st century with his sure-footedness, which plays intomore than 15 million total album sales and dozens of sold-out stadium shows. Continuing with that momentum he becomes only the second Country act in history to score four consecutive chart-toppers on the all-genre Billboard 200 albums chart with REARVIEW TOWN, as all seven of his previous LPs have achieved PLATINUM certification or better. Aldean's wide-open approach has made him a perennial live-show favorite for the format as he has headlined the biggest stadiums in the United States. "This is unquestionably Jason Aldean’s week" (CMT) with his two-week No. One single and album, as he launches his HIGH NOON NEON TOUR with special guests Lauren Alaina and Luke Combs in Kansas City, MO (5/10), Peoria, IL (5/11) and Des Moines, IA (5/12). For more information and for a full list of upcoming tour dates, www.jasonaldean.com. NASHVILLE, Tenn. (March 16, 2018) – HT Nashville LLC, an Ohio-based real estate holding company formed from the ownership group of TC Restaurant Group LLC, has purchased the building located at 305-311 Broadway and 105-111 3rd Avenue South in downtown Nashville with financing by Capstar Bank. The 51,958 square-foot building is currently home to TC Restaurant Group’s Tequila Cowboy, WannaB’s Karaoke Bar, Sun Diner and Luigi’s City Pizza. TC Restaurant Group will continue to operate these existing venues with plans to open two new multi-level entertainment destinations, to be announced soon. These additions will expand the building by 23,000 square feet, creating a 75,000 square-foot space. This four-level dining and entertainment complex will be the largest in Nashville. “With the purchase of this building, a multi-million dollar expansion and soon-to-be-announced new venues, TC Restaurant Group is excited about its continued commitment to and investment in Nashville,” says spokesperson Katie Goyette. TCRG’s most recent Nashville opening is multi-PLATINUM duo Florida Georgia Line’s FGL HOUSE, the restaurant group’s first artist collaboration, located on 3rd Avenue South. They also operate popular SoBro restaurant and bar Crazy Town, as well as Sun Diner – Nashville’s first 24-hour diner – that celebrates the history and legacy of famed label Sun Records and was created in conjunction with the musical icon. The original Tequila Cowboy and Wanna B’s Karaoke Bar opened its doors in 2012 on Nashville’s landmark Lower Broadway strip. Luigi’s City Pizza opened its first location on 3rd Avenue, directly beside its sister locations on Broadway, in 2013. TC Restaurant Group also operates additional Tequila Cowboy outposts across the country with locations in Pittsburgh, PA, Columbus, OH and Lansing, MI. It’s no secret that many of the biggest stars in Nashville’s music history got their start at 706 Union Avenue in Memphis; the original address of Sun Records. Such legendary performers as Elvis Presley, Johnny Cash, Jerry Lee Lewis, Carl Perkins and even Conway Twitty passed through the historic studios of Sam Phillips throughout their careers. That legacy will soon be celebrated at the Sun Diner. Located at 105 Third Ave. S in downtown Nashville. The eatery – which will be opening in October 20 – will serve a tribute to the music that came from Phillips’ studio. “The musical histories of Nashville and Memphis are forever intertwined with each other, with so many artists beginning their career at Sun before taking their music to Nashville – and all over the world,” said Kevin Keller, Director of Operations for TC Restaurant Group, the company which owns the establishment and hopes to continue the tribute to Sun Records in cities across the country. Continuing with the theme of making history, Sun Diner will be Nashville’s first 24-hour restaurantto be located in the downtown area of Music City. The restaurant will be a likely destination for tourists – and locals – who might be looking for one last taste of southern hospitality during the early morning hours. The menu at the Sun Diner will most definitely take on a Memphis flavor with such listings as the “Love Me” Tenders – named after the classic Presley hit, as well as the “Cry, Cry, Cry” Hot Wings – with its name taken from the first major hit record from “The Man In Black.” Among the entrees include the “Million Dollar Quartet,” with its moniker taken from the iconic December 1956 session at the label with Presley, Lewis, Cash, and Carl Perkins. Consumers will get to pick their choice of four items among such delicious fare as Crispy Bacon, Sausage Patty, Chef Thomas’ Hash Brown, Cage-free organic eggs any style, Pancake, Waffle, and Granola Parfait. The Sun Records story began in 1952 when Phillips founded the label. Among the other artists that received early exposure from signing with Phillips include Roy Orbison and Charlie Rich. Though much of the aforementioned artists were very much influenced by the R&B stylings that were coming out of the Bluff City and Mississippi, Phillips also cut much-respected music on pure Blues artists such as Howlin’ Wolf, Rufus Thomas, Jr., and Roscoe Gordon. Phillips also produced what Rock and Roll aficionados consider the first Rock and Roll record, “Rocket 88” by Jackie Brentson. Sun Records was bought in 1969 by the Nashville-based Singleton family and continues today under the leadership of John A. Singleton, President and CEO. Downtown's collection of honky-tonks and bars continues to grow, as TC Restaurant Group, the owner of Tequila Cowboy, WannaB's Karaoke Bar and Luigi's City Pizza, has opened a new three-story bar, restaurant and live music venue on Broadway. Called Crazytown, the new nightlife spot is located at 308 Broadway, which formerly housed Earthbound Trading Company on the ground floor. A grand opening party was held last night at the three-story venue, which features six bars, stages on all three levels and two outdoor patios looking out onto Broadway. According to the bar's website, the interior "was constructed from [four] barns, contains antique signs, features [two] handmade 20' guitars and even has a dentist chair," the latter of which would presumably be to aid in shot-taking. As for food and drink, the menu (also see below) runs the usual gamut, offering starters, salads, sandwiches, burgers and melts. There is of course a now-mandatory take on Nashville hot chicken, and the Crazytown burger rings in at $15.95, making it one of the most expensive burgers in town. Drinks include beer, wine and a small variety of cocktails. Open hours are 11 a.m. to 3 a.m. seven days a week. © 2019 TC Restaurant Group. All Rights Reserved.